The Secret Lives of Hoarders is much more than harrowing tales of attacking the ugliest, dirtiest, and most shocking hoarding cases in the country. It is a behind-the-scenes look at this hidden epidemic- what it means, how to recognize it before it gets out of hand, and how to deal with it. The Boston Globe calls it a "compact, compelling page turner." In Pilot Error, Phaedra Hise delivers an engaging and lucid account of this tragic true story. Drawing insight from her own experience as a pilot, she places the reader in the cockpit of a plane that faces imminent disaster. This fast-paced book reveals how even a skilled pilot can easily slip into trouble, with one seemingly insignificant mistake leading to another, setting off a deadly chain of events. Pilot Error is a fascinating story about our human tendency to tempt fate, sometimes with terrible consequences. 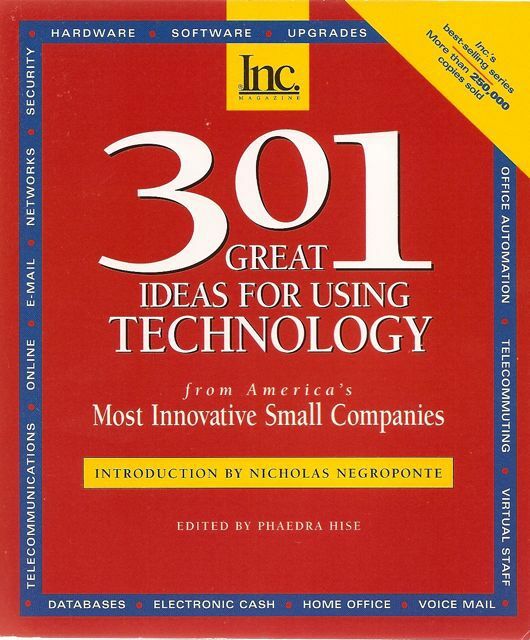 Part of Inc. Magazine's wildly successful "301" series of business-help books. This title organizes examples of how smart companies use technology into sections, covering telephones, travel equipment, laptops, networks, online technologies and more. Amazon says: "Hise's book is probably the best text out there for those intelligent laypeople who aspire to profit and succeed on the 'Net. The book shows you exactly how some small and mid-capitalization firms are actually putting the internet to good use....presented in a clear, easy to read fashion."